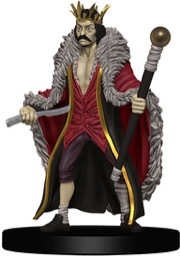 For this week's unveiling of fantastic Pathfinder Battles: Crown of Fangs miniatures, we are starting with the Emperor's Thug. This mini is a medium common in Crown of Fangs, and is highly versatile. Easily useable as a fighter, ranger, rogue, woodsman, trapper, of whatever you need a gruff, slightly bedraggled miniature for. Hey, you guys should totally check out the Cabbagehead miniature. It is a mMedium uncommon, and is actually modeled after an Ogrekin that you encounter in the first chapter of the Curse of the Crimson Throne Adventure Path, Edge of Anarchy. While he is an Ogrekin, you could just as easily use this miniature as a stand in for a flesh golem, skinstich, or any variety of flesh warped creature. Last but not least, we have The Emperor. 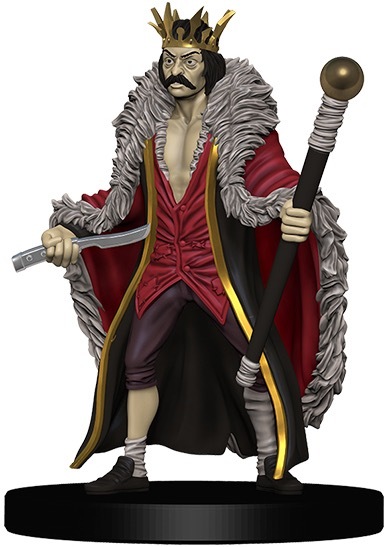 He is a medium rare in this set, and is modeled after the NPC Pilts Swastel, a deranged bard that takes over part of the city of Korvosa in Curse of the Crimson Throne. He is also very well portrayed in the Pathfinder Legends representation of Escape from Old Korvosa, put together by Big Finish Productions. This miniature could be used as a jester, slayer, rogue, or other despotic NPC to bother and generally frustrate your players with. I like the Thug, standard mooks are always welcome. Cabbagehead is too small to sub for a flesh golem, but may work as a carrion golem, a bloatmage, or possibly a lemure. Probably won't be too useful for me. I really like the Pilts miniature, though I don't know when I'd use it. I enjoy these write-ups, but as a first-time player in Curse of the Crimson Throne, I'm disappointed to see two spoilers in a front-page blog post. The thug is really good to have. "Armed Civilian" sounds less exiting I guess, but is just what he looks like. The ogrekin... on per set would have been enough for me. The emperor... "Crazy King" sounds more fitting ;-) I'll reserve a place as the Black Marquis for him. There's always huge demand on the market for thugs, so I'm thrilled whenever a new one releases, and this one looks great. The Emperor is fun and interesting too. The ogrekin looks cool, but of the 3, it's the one I'm least excited about. Good release, though! Thanks, Mike for taking over the previews. 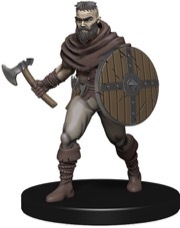 It adds to my Friday to know when I get done with work I'll get to see new Pathfinder Battles minis. The thugs are a good staple piece that will get used frequently. Surprisingly, I think the Emperor will make it on to the table a few times as well. I don't know what to think about the Cabbagehead. He is disgusting, but that doesn't preclude him from being worked into a campaign. I'm going to have to contemplate him for a while before I reach a verdict. 1: The Emperors Thug is a mini that i don't like, as i have over a dozen different mooks, at least 2 with the axe/shield combo. I can cut away the axe on one of the 4-5 E.T.s, but shields are not as easy to remove. Also "Reign of Winter" has a few similiar thugs if i remember correctly. 2: Cabbagehead looks so unique, that i can't use more than one of him, but a case has 3-4. It's nice to have a second Ogrekin after the one from set 2/RotR though. 3: Do i need another mad looking guy with a crown after King Irovetti being in 2 different cases? No, i don't. We now have 30 revealed minis, 15 of them humanoids, which is a little too much imo. I happy with all 3. I agree Marco we could have seen more unique feeling minis from the path but I can see a clear use for all three in my games, although 3-4 of cabbage head is Bordering on too many. This is still shaping up as one of the best sets yet, "one of" simply because of the AP specific nature of the set - I personally like more generic sets. By my count Marco we have around 4 commons, 3 medium uncommon, 2 large uncommon, 3 large rare and 3 medium rare to go. Dressing and incentive as well obviously. Really looking forward to these in hand. Please wizkids get the painting right! not all of us have been collecting minis since forever. ... Also "Reign of Winter" has a few similiar thugs if i remember correctly. RoW had a few rares with axes. LoG has the tooth gang, Lost Coast had the Lamashtu Thugs and WotR the low templar. All of which don't look like just some civilian. Do i need another mad looking guy with a crown after King Irovetti being in 2 different cases? You are complaining that we got a replacement for the awful paint job that the first incarnation was? Also Irovetti was armoured and fully equipped, this one looks rather deranged. Ratibor the Bold is an uncommon and still available. He is armored, though. Greta and Nadya (axes) are uncommon too, but they are female and have no shield. The problem for me is, that i can only use two of the "Emperors Thug", but not 4-5. I wasn´t complaining about the replacement, i just wrote that i already have two of King Irovetti (my replacement looks only slightly better). 3 commons, 4 uncommons, 2 large uncommons, 3 large rares and 2 medium rares are unrevealed. the two halflings, the Emperor´s Thug, Cabbagehead, the Grey Maiden Captain and the Red Reaver - the rest is pretty solid rarity-wise. There is no mini that i don´t like sculpt-wise, which is pretty amazing! Ignorance is bliss, I have heared. The minis that aren't obvious I have to ask for the beastiary and page to look them up, the "potentials" I don't recognize and won't bother looking up till they come up. So I have no clue what is "missing". Mostly I'll think "someone else will need it", that's why I didn't comment last week. The only time I was really pissed off was at the Marilith (Serpent demon) in LoG which was, quite frankly, rather s#&*ty and got de-valued even more with Aponavicius in WotR. With the Balors as the next big offenders at WhyTF? That set still makes my miniatures storage smell of paint btw. The only time I was really pissed off was at the Marilith (Serpent demon) in LoG which was, quite frankly, rather s#! !ty and got de-valued even more with Aponavicius in WotR. With the Balors as the next big offenders at WhyTF? So far all of the shown computer renders for this set (except for the two halflings, the Dream Spider, the Giant Scorpion, the Geist and the Banshee) are taken from full body illustrations found in the "Curse of the Crimson Throne" hardcover book (i´m not sure about the Bone Devil). All the possible rare miniature names i dropped are full body illustrations from the same book, do you have it (or the single AP issues)? -"Blackjack" is essentially a masked guy in all black leather (vigilante) with cape and a rapier. -"The Cinderlander" is a human mercenary with a repeating heavy crossbow cocked in both hands. -"Gaedren Lamm" is an old human male rogue/crimelord and the reason the PCs start the adventure. -"Jolistina Susperio" is an elven female dressed in a brightly-colored jesters outfit with a handcrossbow. -"Krojun" is a very muscular shoanti barbarian with an earthbreaker (heavy warhammer) in one hand and a klar (spiked shield) in the other. -"Lady Andaisin" is a human female in a green dress with a large scythe. I've got the hard cover pdf in the shopping cart, but I won't read it till I run it. Wednesday 17th of may 2017! That´s 6 weeks from now and 7 weeks before "Icons of the Realms Set 7" is released (on the 5th of july). Wow, thanks for the link, that really shows a lot of cool pieces. The case incentive is awesome! I'm still hoping Mike has time for some more previews, as I'd like to know more and get some better shots of the pieces. Indeed the incentive look great and i'm realy looking foward to this set. And I agre that even with the Wizzkids reveal, some more previews are welcome, I'm always looking for it on friday! Wow, what an awesome set! -Lillend Azata (LARGE, most probably RARE) - thanks again Erik & Mike! -Human girl? (small uncommon) - this is awesome! The incentive is awesome! Is that a little white dog I see in a couple of the pictures? A simple dog is something we've not had before and would be very useful. -Well (large) - awesome looking! -pillory (medium) - great idea! These are all very useful pieces in my opinion! Yes it is, and it´s the missing small dog (after the medium Riding Dog from Rusty Dragon Inn)! This set looks very good, especially the Grey Maidens and the "Dungeon Dressing" pieces. -This is the set with the highest humanoid rate yet. -The Leukodaemon is HUGE, literally. -The inclusion of an Owlbear Skeleton over a Minotaur Skeleton is strange. -There are 8 different undead creatures in the set. -There are 5 different "Crusaders" (why?) in the set. -There are 4 different Grey Maidens in the set. -There are 3 different Red Mantis Assassins in the set. -The omission of the Queen´s Physician, Marai Rakshasa, the Cinderlander and Gaedren Lamm minis are strange. All those Glorious Reclamation knights will come in handy for anyone running Hell's Vengeance. That's one of the benefits/losses of it not being a "Curse of the Crimson Throne" set - other stuff can make it in. The only absent mini I'm really disappointed about is the Queen's Physician; the rest, I can live without. A female Shoanti would have been nice, but the one I like best won't become a miniature, so I'm not terribly troubled. Realy missed opportunity with not including Taniniver in the case incentive. We get pillar, realy? Seem very light on shading. Look like most have clean paint jobs but with no shading, step backward if that's the case, especially since these are paint masters most likely. Overall looks quite impressive, that's a hell of a great incentive. I am confused about the large representation of crusaders, plus we get Sial but not his counterpart? The pillars look great, nicely detailed, really like the flaming sconces. The next set will hopefully contain huge minis, perhaps we'll get a tininiver in that, would be a great choice, unique enough but useful as what it represents or an undead dragon. All those Glorious Reclamation knights will come in handy for anyone running Hell's Vengeance. They'll come in handy even for us that aren't running Hell's Vengeance. I think one of the biggest strengths of the Pathfinder Battles line is that it provides us with wonderful warbands. Granted, this may be a side effect of using the Adventure Paths as a primary source for set content, but it is a great benefit regardless. I can't wait to get these guys in hand. And, the Gray Maidens and Red Mantis corps. ... or an undead dragon. Nerds on Earth just got a review brick. Once I double check with Wizkids to make sure there is no embargo date on showing them off, I'll share a preview video link for everyone. Not the incentive, Erik strongly hinted at huge minis in the next set. meh, IMO there are more important options around than an undead dragon for huge. Or a live huge dragon. anything else really as the black huge of H&M took quite a while to sell out. Sorry for the janky Facebook Live video, but I promised I'd share this ASAP: Unboxing Crown of Fangs brick. I think I pulled a few that haven't been previewed yet, so that's nice. Of course, it will be better as we get these higher resolution looks here on the blog! Thanks for the preview Clavejones. Very cool to see. Agree on Gaedron Lamm. That would've been the figure I'd love to see as the 48th. I would have preferred Laori, to be honest. She and Sial (who does appear to be present) are relevant to longer periods of the story than Lamm - especially since they travel with the party. There's always next set, I suppose.